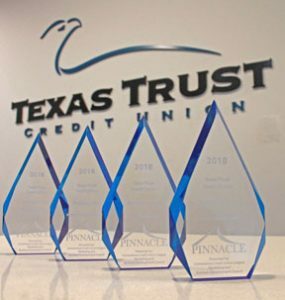 ARLINGTON, Texas – November 27, 2018 – Texas Trust Credit Union received four Pinnacle awards from the Cornerstone Credit Union League at its annual marketing conference. Pinnacle awards recognize excellence in credit union marketing, public relations, and business development. The Your Future is Bright campaign was a community celebration event honoring the inaugural class of the Arlington Collegiate High School. Texas Trust held a festive family party at its headquarters and gave each graduate a $1,000 scholarship. The event was devoted to the students and their families to share in the graduates’ accomplishment of simultaneously earning an associate degree along with their high school diploma. Award winners were recognized at the League’s annual marketing and business development conference in Tulsa, Oklahoma.